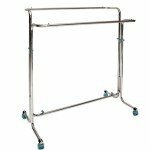 Metallic clothes rack with wheels width 130cm. height adjustable with double bars﻿up to 200cm. with double bars and﻿ locking screws. Used to hang all kinds of clothes. Widely used in shops, stores, wardrobes and closets. • Credit / debit card. This payment is immediate, completely secure and verified by VISA or MASTERCARD. All payments made using this method of payment will be validated by your bank and if accepted it will be sent automatically and instantly. Requires a security key to perform this type of online payments. Ask your bank if you dont know your security key for secure payments online shops. We accept VISA / VISA Electron and MasterCard / Maestro. This payment method overrides the pre-applied 2% discount on prices.